Drink More Water to Hydrate Skin? Laser Hair Removal | Does it work? Fat Freezing to Shape Up! Fillers - What Are They? Chemical Peels | What are they? Microdermabrasion | What is it? Lip Filler | Is it Safe? Laser Hair Removal | Smart to do? Facial Fillers - What are they? 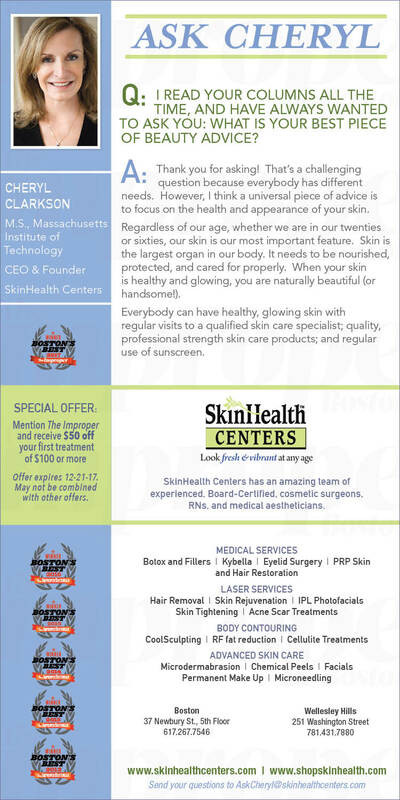 Cheryl Clarkson, founder of SkinHealth Centers, is Boston's go-to expert for advanced skin care services, laser, cosmetic non-surgical procedures, plastic surgery and home skincare with SkinHealth's award-wining products. The latest "Ask Cheryl" artlice is below below and a menu of the growing collection of articles can be linked at left. Enjoy and send your own questions to “Ask Cheryl.